By KENNEDY KANGETHE, NAIROBI, Kenya, Sep 17 – President Uhuru Kenyatta has directed the National Treasury and the Kenya Revenue Authority (KRA) to publish regulations clarifying the VAT law to Kenyans. Kenyatta said on Tuesday that clarity would bar unscrupulous traders from taking advantage of ordinary citizens and overpricing goods. “Whereas the VAT law is clear in its design, there have been questions about how it has been interpreted and the National Treasury should move in fast to clear the air on the issue,” he said. Kenyatta said that the objective of implementing the law was to simplify the tax regime, cushion the poor and increase revenues for the government. “We are sensitive to the vulnerable in our country. Basic commodities like milk, flour and bread are exempted from VAT,” he said. His directive came as Coalition for Reforms and Democracy (CORD) lawmakers revealed plans to introduce amendments to the VAT Act to exempt basic commodities. “CORD will sponsor immediate amendments to the VAT Act to cushion ordinary Kenyans from their present suffering,” Budalangi Member of Parliament Ababu Namwamba announced after a meeting of CORD legislators on Monday. 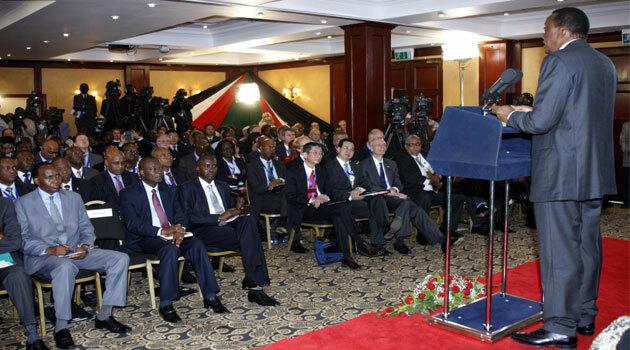 President Kenyatta spoke at the opening of a high level conference on Kenya’s economic success, prospects and challenges at a Nairobi hotel convened by the National Treasury, the Central Bank of Kenya and the International Monetary Fund. Kenyatta also said his administration will trigger an industrial revolution that will propel Kenya to a middle income status by 2030. He said as a starting point, concentration will be on infrastructure where road and rail networks will be expanded and power supply increased. “The Kenya Vision 2030 has brought us to the stage where we are laying a robust national economic foundation. This entails the implementation of programmes in infrastructure, energy, security, science, technology and innovation,” he said. He explained other priority sectors include agriculture, tourism, trade, manufacturing, ICT and, starting this year, oil and other mineral resources have been scaled up. The President appealed to all Kenyans to join hands in supporting the country’s economic rejuvenation in line with the Jubilee Coalition’s principal pillars of Umoja (Unity), Uchumi (the Economy) and Uwazi (openness). IMF Africa Director Antoinette Sayeh commended Kenya’s home-grown economic reforms which have set the country as example worth being emulated in Africa. She said the IMF will continue supporting Kenya in its efforts to grow the economy and improve the lives of citizens.